Why should trustees be concerned about oversight of their fiduciary manager? The Pensions Regulator makes very clear that trustees are ultimately accountable for all decisions made in relation to the appointment and monitoring of the Scheme's fiduciary manager. It emphasises the need to have processes in place to monitor the actions of these advisers including a process to 'regularly evaluate their performance and service'. Trustees should also ensure that all their advisers and providers have adequate arrangements in place for disclosing and managing conflicts of interest. What are trustees really accountable for in a fiduciary management relationship? The Pensions Act 2004 states that trustees are accountable for all aspects of the Scheme including investment of the assets and maintenance of the funding ratio as agreed with a Scheme's sponsor. It is essential that prior to and once implemented all roles adopted by the trustees, fiduciary manager, custodian and other advisers are clear. How this compares with a legacy advisory relationship. This emphasises the differences between the two models and highlights the importance of robust oversight of the fiduciary managers given the breadth of discretion the manager is likely to have. What about the extra costs of oversight? IC Select believe that, as long as appropriate reporting requirements for the fiduciary manager are established as early in the set up of the arrangement as possible, much of the cost can be absorbed by the fiduciary manager within their fiduciary management fees. If the structure and approach is not addressed promptly, then governance oversight can add significant additional cost to a fiduciary management arrangement. The framework also leverages the extensive due diligence carried out by IC Select on fiduciary managers. 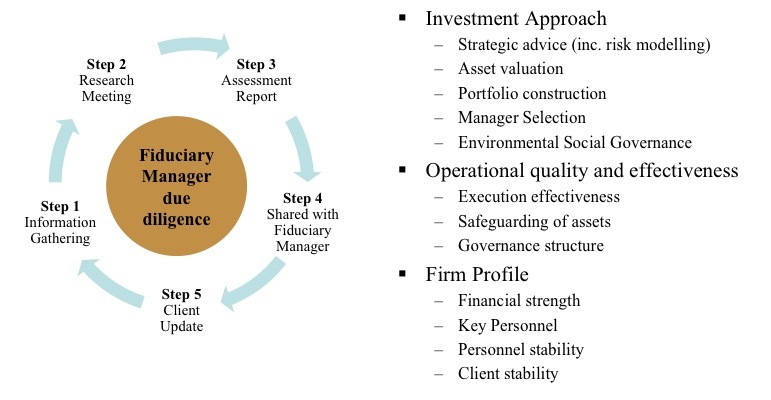 What is IC Select's process of due diligence on fiduciary managers? The operational and governance capabilities of the business. The second step is regular due diligence meetings with the managers. These meetings allow IC Select to evidence that all aspects of the areas covered in the due diligence questionnaires are being implemented consistency as indicated. IC Select's approach is research led meaning that the firm updates its due diligence on nine of the largest fiduciary managers every six months. The firm's assessment of fiduciary managers, which is conducted by experienced practitioners in both investment and operations, is from an investor's as well as investment perspective.